Great quality Surrounds! The Tibhar Full Cover Barrier features new surround construction. Unlike most barriers, the cloth completely covers the steel pipes on all sides. Made with robust 210D nylon cloth. Available in blue, green, or black. Price includes shipping with a minimum order of 3. 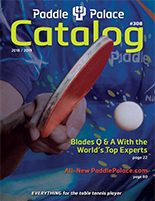 If ordering fewer than 3, Paddle Palace will contact you with a shipping quote.